We are delighted to announce that we have moved offices! Where have we moved? Loulaki Blue is now located in Clarke Street, in the vibrant heart of the creative hub of Crows Nest. We are located on the second floor in a unique light filled, open plan office. This new office space is ideal for creative thinking and offers direct access to the abundance of vibrant cafes and creative spaces that the Crows Nest community has to offer. Why the change you ask? We have been operating on Sydney’s Northern Beaches for eight years in a great eco building however it was a great distance away from much of our client base. We found that a great deal of our time was being spent on commuting to our clients, or rather our clients were wasting their precious time commuting to the Northern Beaches, trying to push through the gridlocked conditions of the infamous Military road. We wanted to ensure that our premises were somewhere that was more central to our clients so that there was less time being spent on commuting and more time being spent on the creative communication process itself. Crows Nest was our answer! It has been a magnificent eight years for Loulaki Blue operating from the Northern Beaches. 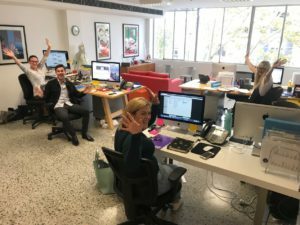 Our old office in the Lifestyle Working Building served us very well and we made rich memories there, however we couldn’t be more energised about our new central space. The hustle and bustle happening outside, the greenery outside our windows and all of the buzzing cafes within an easy walking distance are already enriching our days at work. We look at our new location as a fresh start and opening another chapter in Loulaki Blue’s story. It’s been a busy few weeks of packing and moving, but now that we are all set-up, we look forward to welcoming you to our new office premises. We invite you to come and say hi soon and not to mention, you can come and give Moose, the new Cavoodle puppy, a cheeky little snuggle! Our new office address is 111/8 Clarke Street, Crows Nest, 2065. There is plenty of available street parking close by, as well as council early bird all day parking for $23. The offices are also walking distance to St Leonards train station.